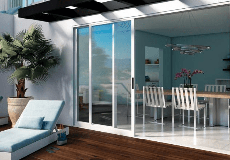 Keeping your windows and patio doors clean doesn’t have to be a chore! We’re happy to share with you 7 quick and easy “life hacks” to help make the process a lot more fun. We think you’ll find it simple follow along and if you need the recipes and a list of items, we’ve included them below. If we can do it, we know you can too. Happy cleaning! You’ll need a tape roller to get fluff, dirt and pet hair off your curtains or blinds. Wrap the cloths around the end of the tongs and secure with the rubber bands. Spray the cloths and insert the tongs into the wooden blinds. Press the ends together and pull back and forth to clean. Use a small vacuum, or canister style vacuum with a wand attachment, to remove dirt from the track of your patio doors or windows. Use your tape roller to remove dust and dirt from the inside or outside of the screen. You can leave the screen in place, or remove it. Whichever is easier for you. If you have second or third story windows and find it challenging to clean the exterior, you’ll love this idea to extend your reach. Add paper towels to the flat end and press them into the holes, or, secure with some tape. Want to learn more? See our other DIY video tips for keeping your Milgard Window and Patio Doors working and looking their best. I like the idea of using a canister style vacuum in to remove the dust and dirt on and around your windows. We will also follow all your tips.